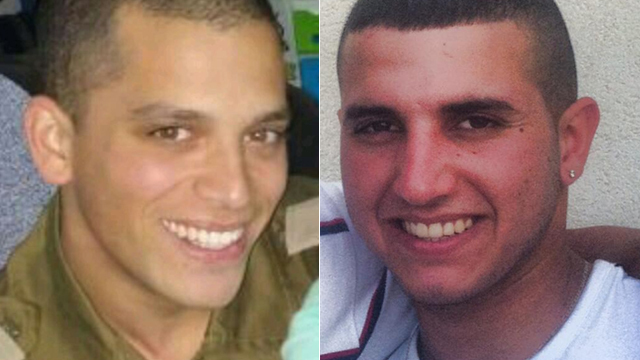 January 28, 2015 - The two IDF soldiers killed in the Hezollah attack on Wednesday morning have been named as Captain Yohai Klangel and Sergeant Dor Nini. Seven others have been wounded in the attack. Dor Nini, from Moshav Shtulim near Ashdod, was a combat soldier at the Givati Brigade's Tzabar battalion. Nini, who fought in Gaza during Operation Protective Edge, was posthumously promoted to the rank of Staff Sergeant. commander of the Tzabar Battalion's supporting company, and received the president's award for excellence on Independence Day last year. The incident occurred at about 11:30am Wednesday, when a Hezbollah anti-tank missile hit an IDF convoy near Har Dov and Shebaa Farms, a disputed tract of land where the borders of Israel, Lebanon and Syria meet. The The IDF ruled out the possibility of a kidnapping attempt, despite reports from Lebanon claiming otherwise. The troops that were hit were conducting a patrol in the sector as part of the high alert level in the north. The soldiers stationed in the area were supposed to serve as reinforcement troops in the case of escalation. Hezbollah claimed responsibility for the attack, which it said was in retribution for an Israeli assault in Syria that saw a group of its fighters killed. Prime Minister Netanyahu vowed to respond "with force" to Wednesday attack. A Spanish UNIFIL (United Nations Interim Forces in Lebanon) soldier was killed after the IDF responded with fire into southern Lebanon. The incident took place a day after the IAF responded to a rocket attack directed at Israel from Syria, which reports said Hezbollah forces in Syira were behind. Lebanese security officials said Israel later fired 25 artillery shells into Lebanon after the anti-tank missile attack. Lebanese officials said that IDF shelling targeted the border villages of Majidiyeh, Abbasiyeh and Kfar Chouba near the Shebaa Farms area.